I think most people will agree that the biggest surprise of the Midtown Lunch Sandwich Challenge was the duck pastrami reuben created by FreeFoods NYC (on 45th btw. 5+6th & 52nd btw. 3rd+Lex). It was so delicious, that most of us were willing to ignore the fact that it was kind of small, and very expensive ($9.95). It was especially hard for those who vowed never to step food in a place that serves the kind of super expensive raw/vegan/organic/yuppie food that FreeFoods is known for. But the sandwich was freakin’ awesome. And in the end taste triumphs over everything. And then the unthinkable thing we knew was going to happen, happened. They raised the price. Part of the Midtown Lunch Sandwich Challenge is that everything had to be under $10… so they introduced it at $9.95, only to raise it to $12 now that the sandwich is so popular. Normally I would institute an immediate boycott, but FreeFoods was too smart for that. They simultaneously introduced a new $9.75 sandwich, that sounded too good to pass up. It’s not part of the Sandwich Challenge, but the owner admitted that they made it with the Midtown Lunch readers in mind. 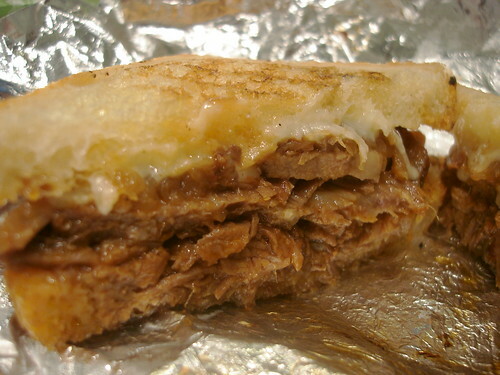 Sloppy Leo’s Brisket Melt. An ok amount of Brisket, smothered in agave BBQ sauce, topped with carmelized onions, and hickory smoked gouda, on two slices of Sullivan Street Bakery filone. Oh man. We’ve got another winner people. The BBQ sauce is perfect, with the agave adding this amazing fruity sweetness (but not too sweet) that makes it completely different than any other bbq sauce I’ve had before. The brisket is great too, with a nice thick layer of perfectly cooked fat that melts in your mouth. You can never go wrong putting anything on Sullivan St. Bakery bread. The cheese adds that wtf factor, and I didn’t notice the onions- but all together it made for an amazing amazing sandwich. What can I say? I’m a big fan. Yes, it’s too small. Yes, I freakin’ hate paying $9.75 for a small sandwich. Sure Daisy May’s BBQ Cart might be better. (And if you are a BBQ purist, where smoke trumps all, you’ll probably hate this sandwich.) But in the end, for me, taste trumps all and I will admit that you guys have somebody in the kitchen doing something right. I thought I was out… but you keep pulling me back in. Free Foods Pulls Terrible Duck Reuben Bait and Switch! FreeFoods Duck Pastrami Sandwich is a Triumph. A Freakin’ Expensive Triumph. Posted by Zach Brooks at 11:45 am, May 7th, 2009 under BBQ, FreeFoods NYC. I, For one, will NOT succumb to the evil manipulations of “Free”Foods NYC! Hiking the price on a ML sandwich entry? BS!!!!!! It is entirely possible to sell a small sandwich withb decent ingredients for under $10 (not that I will shell out the $9.99 or so they charge to technically make it under the wire). But then FF hikes the price to $12? SUCKERS!!!!! We don’t need no stinkin’ super expensive raw/vegan/organic/yuppie food here! If I want a tasty morsel/snack, there are lots to choose from. But FFNYC is NOT a Midtown Lunch despite their gimmicky (and temporary) under-$10 price that they ‘generously’ offer. NO MORE OVERPRICED SNACKS OR YUPPIE BARS ON ML!!!!!!!! Most ironic name for a place with $12 sandwiches..
….well id rather pay $3 more and be served by a rude jew than hemp wearing bloody hippy. Fredo, I know it was you who increased the size of the duck pastrami ruben! @RudyMcB: You also neglect to mention that the Katz’s sandwich is approximately eleventy billion times the size of the Free Foods offering, and comes with free super-sour pickles. EDIT: price, not size! My kingdom for an edit button! I’m man enough to admit that the Duck Pastrami is a reasonably good New York City value at $12. That is a huge, gourmet sandwich with exceptional ingredients and unlike anything you can find elsewhere. Just had the brisket. It is indeed pretty damn good. the bread is fantastic and the cheese id piled on heavy. my meat was a bit undersauced oddly enough. but i am full. and satisfied. Can I just take a second and talk about how everyone (apparently including you Zach) is so in love with Daisy May’s? Is it because Chef Lang went to a fancy culinary school or worked at Michelin starred restaurants? Anyone that knows good BBQ knows that the best is made by toothless country folk, the exact opposite of who is running Daisy May’s. I’ve eaten there about 5 times, only because EVERYONE in New York raves about how good the BBQ is, and I think I might just be catching them on bad days, but everything is terrible. I could go on…but I just want to know why everyone is praising this mid-grade BBQ on a daily basis. @tyler – I don’t think Daisy May’s is the greatest BBQ of all time. I think their pulled pork is waaaaay too sweet (practically inedible), and some of their sides are better than others. But I think their dry rub ribs are pretty awesome… as are their sweet and sticky ribs, if you’re into that sort of thing. I do agree with you that the place is grossly overpriced. In the end, BBQ is pretty similar to pizza, and burgers, and Mexican food, and pretty much almost everything… you’re never going to get everybody to agree. And even worse than that, when somebody tells you something is amazing, you’re probably going to be more critical than if you had just walked in off the street on your own. Think of it this way… Imagine if one of us moved to Texas (or N.C. or Memphis), and everybody there was like “go to this pizza place, it is so freaking awesome.” No matter how good it seemed to those people recommending it, we probably wouldn’t think it was all that great. Who is right? RE: Tyler & real BBQ in NYC. I’m a member of the National BBQ Association and a backyard BBQ hobbyist. Just last year, I got serious about cooking & eating real BBQ. I’ve been slowly eating my way across NYC & LI. Ever try RUB in Chelsea, rubbbq.net ? It doesn’t fall into the ML/low-price genre but you get what you pay for. Real BBQ that not over smoked or over sauced. Kansas City BBQ author/instructor/pitmaster Paul Kirk is the guy behind it. The brisket, pulled pork & ribs were great. The chicken & turkey were good. I thought the sausage & ham was just OK. The beans however were fantastic. Most beans is just beans, but at RUB, they did beans right. There is also Hill Country in Chelsea too. They cloned Lockhart, TX BBQ joints Kreuz Market and Smitty’s and added Austin’s live music dropped it right into NYC. Since they copy famous TX places, it is setup like a butcher or a meat market. Don’t be put off by the very different feel & vibe in the place. I had fatty brisket and it was great & very similar to Lockhart & central TX brisket. I haven’t tried Daisy May’s, Blue Smoke, Virgils, Dinosaur but I hope to try at least one this weekend. Ooops…. did I type that out loud? “Imagine if one of us moved to Texas (or N.C. or Memphis), and everybody there was like “go to this pizza place, it is so freaking awesome.”"
I knew BBQ has a huge following in TX but pizza? I never tried the Austin, TX pizza but my brother did and he said it was just passable while the other Austin folks loved it. My only gripe about free food ( i don’t actually mind paying a little extra for good food ) is the inconsistency of what you get. First brisket sandwich i got was shredded/pulled brisket drenched in a cloyingly sweet BBQ sauce. It was good but a little too sweet. Last time i had it it was slabs of brisket and less sauce more resembling the pictures here. The duck reuben is also somewhat hit or miss. I mean it’s a great sandwich no matter what, but the first one i got was one of the best sandwiches i’ve ever had. The last time i got it it paled in comparison. Plus i always feel like they’re trying to talk me out of getting what i ordered. “oh, that’s gonna take a while to make….” or “We’re out of the bread we us for that, why don’t you try this…” Who runs out of bread at one in the afternoon? Good point about the inconsistency. 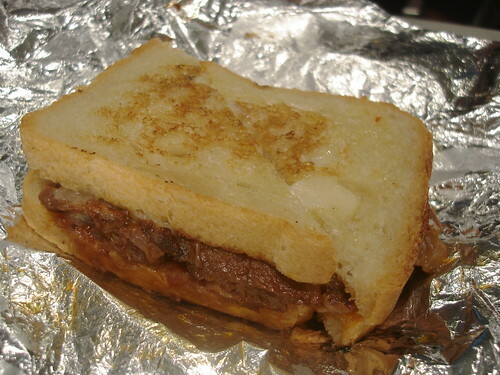 I got the brisket sandwich today and it looks nothing like Zach’s pictures: http://twitpic.com/4sfre It was quite tasty, though (and this is extremely unusual coming from me) a bit excessive on the cheese. No problem finding the onions, either. Co-worker and I both liked it but think the duck pastrami still has the edge, price notwithstanding. Notes: 1) Actually had this for dinner, around 7.. great that this place is a open beyond lunch; 2) my bread was different than that in Zach’s pic, but still something special and buttery. Frankly, I’d stick with the duck reuben although this is a great sub. I have to mention the service here is super friendly. There we so many orders of the brisket that i had to wait a few minutes (no biggie.. like 10 mins.. that’s nothing)… So they threw in a free cookie… mmm… cookie. Actually, forget the overpriced iced teas.. learn to drink water.. and opt for a cookie… nothing chases down the grease better :> There was something really wholesome about it.